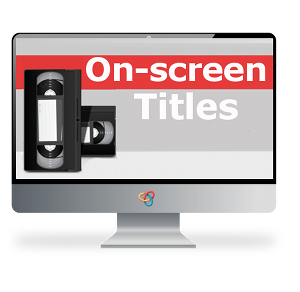 Improve the value of your film or video conversion project by adding onscreen titles to better tell the viewer what they are watching. Onscreen titles are $5 each, and we include the specified information in both the title and table of contents. Typically, the on-screen titles are placed at the beginning of each chapter in a movie, associated with each new video tape on a DVD or Blu-ray Disc, or with each new film reel or set of film reels in film transfer, or at the beginning of video slide show of images captured from photos or 35mm slides. Titles provide valuable information for future viewers and help with future editing projects, helping the editor find important points in the movies. Make sure that your future generations know all of the details about certain events or special memories with on screen titles.